What is the Eiffel Tower the symbol? On such a simple question the answer seems just as simple: From Paris, or from France, it seems obvious. But just search a bit to find that it can be associated with other symbols, symbols that have sometimes been completely forgotten. This is the most obvious, the one that immediately comes to mind. 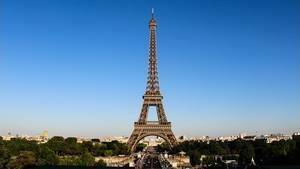 The Eiffel Tower is the symbol of the city of Paris and, by extension, of France. There are several reasons to declare this. First of all, empirically, we see that this is the case. When it is necessary to symbolize France, it is above all the Eiffel Tower that is chosen, as we see in almost all amusement parks that show the monuments of the World (Minimundus in Austria, MiniEurope in Belgium, Park Europe in Spain, Mini Siam in Thailand, etc.). Similarly when a shopping center on the theme of France is built in Brazil, it welcomes visitors with a huge Eiffel Tower. Then by the communication of the representatives of France abroad, which is often done putting the Eiffel tower in the foreground. This is the case on the film presenting the 2012 Paris Olympics, for example. Another reason to think this is in the place taken by the tower in Paris. Wherever one can be seen, at night its presence is manifested by the light beam that sweeps the sky. The Parisians themselves associate the tower with their familiar surroundings much more than any other monument in the city. And if Parisians are in this spirit, that the Eiffel Tower best symbolizes Paris, tourists passing by receive the same impression and report in their cities, their countries, the idea that the Eiffel Tower is central Paris. But being the symbol of Paris makes it symbol of France? A priori no, there is no reason for it to be the case, and yet it is. The reason is organizational across the country. In France, the state is centralized in Paris, which is at the same time the political, economic and cultural capital of France (Although other cities are quite active on this subject), suddenly any monument existing outside the capital goes to a lower level facing the Parisian monuments. Sites like the Pont du Gard, the city of Carcassonne or Strasbourg Cathedral would be good candidates for the international representation of France, but none of these monuments, as well known as it is, will be more than the Eiffel Tower. Even in Paris, the latter has no competition: The Louvre, the Arc de Triomphe or the Sacré Coeur are all less known, internationally, than the Eiffel Tower. Which of the following European monuments best symbolize Europe? Finally a comment on the radiation of the Eiffel Tower abroad. When a stranger is asked to quote a Parisian monument, the Eiffel Tower is mentioned. If we ask for another, their knowledge is directly related to the culture of the person and its proximity (Our Italian neighbors know France better than the Taiwanese, it seems normal). If we do the same test with, for example, New York, people will quote in more varied ways the Statue of Liberty , Central Park, the Empire State Building or the World Tade Center, but the answer will never be unique, proof that there is no building that emerges compared to others. This symbol is no longer relevant, but it was, at the time of the construction of the tower and in the years that followed, the most important argument of the promoters of the tower. The word Genie is to be understood in the sense of Civil Engineering. At the end of the 19th century, from the 1880s, Europe entered the industrial era. The United States had entered shortly before. In the North of France the factories multiply, we discover the driving force of steam and, later, electricity. The extraction of minerals is in full swing and each country seeks to assert its power vis-à-vis its competitors, at a time when nationalism was important. The United Kingdom used its domineering fleet, France its colonial empire. Engineers discovering metal as a building material is embarking on more and more crazy challenges. That of building a 1000-foot tower becomes a gamble spread around the world. The country that will achieve this tour de force will undeniably be considered technologically advanced, and it is France that succeeds first, thanks to Gustave Eiffel. Its 1,000-foot (300m) tower is a technological feat that shows the entire world the technological power of France. It was built solely for that purpose, to serve as an entrance gate to the 1889 World's Fair. The innovative techniques that were used were subsequently used in other buildings, particularly the principle of not building only pieces that, once assembled, could be moved by only two men. He has also implemented a multi-year project monitoring from conception to delivery. Moreover, his calculations were corroborated by the English who tried to build another tower, larger, almost identical. The project was not completed, it was abandoned before waiting for the first floor, but the engineers were up to change their plan, initially octagonal, in square plan to stick to the Eiffel Tower, proof of the effectiveness of the calculations of the Parisian tower. This symbol of the Eiffel Tower is related to the previous symbols: The Eiffel Tower is representative of France, and it magnifies the French genius. By extension, it becomes the symbol of the greatness of France. This is confirmed by its popularity, both in France and in foreign countries, and by its presence in Paris, very pregnant. It's more surprising, but the fact that it happened 60 years ago does not mean it's been forgotten. 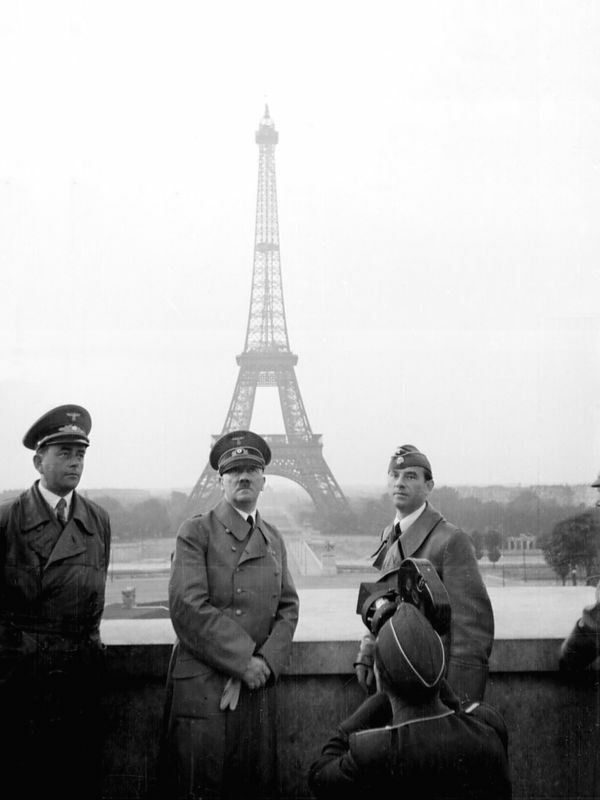 The Eiffel Tower is a symbol of the conquest of Paris by German troops in 1940, then the liberation of Paris in 1944. 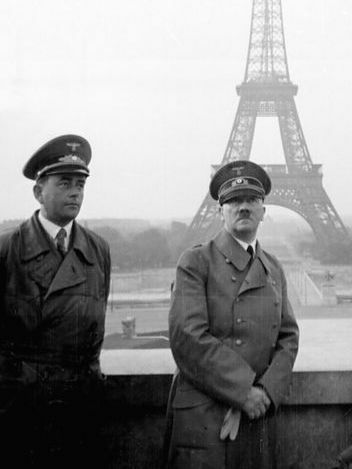 When Germany conquered Paris there were some symbols of this decision, photos that we have from that time: German soldiers marching on the Champs Elysees, but also Hitler in front of the Eiffel Tower. This photo does not seem to be a propaganda company, it looks more like a simple photo without any real meaning. Yet it is symbolic of German power over Europe in 1940. In a happier way for the French, the Eiffel Tower is also the symbol of the liberation of Paris. Indeed, on August 24, 1944, while fighting was raging, Sergeants Henri DURIAUX, Pierre NOEL, corporal Charles ROUARD, the sappers Marcel CONVERSY, André TAILLEFER, the regiment of firefighters of PARIS raised the tricolor flag in the capital still occupied. They were under the command of Captain SARNIGUET. This act of heroism was greeted by the installation, much later, of a commemorative plaque on the 3rd floor of the Eiffel Tower. For the anecdote, you should know that this flag, which was to be large, was made in a hurry by roughly sewing three sheets of different colors. The popularity of the Eiffel Tower in the World makes this monument sometimes used to please a host country, during a treaty, an important meeting, or for a special occasion. We have seen the Eiffel Tower adorn many different colors for a lot of reasons. The Eiffel Tower has been illuminated with the colors of different countries. This was the case in 2004 on the occasion of the Chinese New Year during which the Parisians saw the red tower, the color of China. The illumination took place from January 24th to 29th and stayed on all nights during this period. Note the presence in France of the Chinese Minister of Culture, who participated in the festivities. 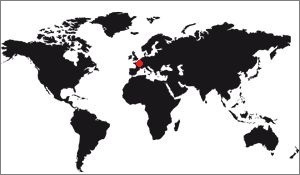 In 2009 took place the season of Turkey in France, from June 2009 to March 2010. On this occasion the Eiffel Tower was illuminated in Turkish colors between 5 and 11 October. She had red on the lower part and white on the heights. In October 2015 took place the celebration of the 130th anniversary of diplomatic relations between France and South Korea. Also to please our guests the Eiffel Tower has illuminated the colors of Korea, during a sound and light show on pop music. Shortly afterwards, the November attacks took place in Paris. On this occasion, the Eiffel Tower has a blue-white-red color as a tribute to France's 130 victims. These attacks allowed the French to reclaim their national colors, and their presence on the Eiffel Tower was welcome. Unfortunately in March 2016 terrorism is again striking, in Belgium this time. The day after the Eiffel Tower is adorned with the colors of the country in memory of the victims. Pleasing the guests of France is good, but the Eiffel Tower has also served to highlight particular causes. So she became a symbol of the fight against cancer the time of an evening. Illuminated entirely in pink, to make known the association "Breast Cancer, let's talk about it", which launched its annual campaign of October that day. It aims to raise awareness of the risks of breast cancer, as its name suggests. Each year it is a Parisian monument that is the focus of this association, and in 2014 it was the Eiffel Tower, after the Opera Garnier or the Montparnasse Tower. In 2008 the Eiffel Tower was illuminated in blue, with the 12 stars of the European flag on its north face. This visual effect was realized on the occasion of the French presidency of Europe, from June 30 to December 31, 2008. It had already been implemented on May 9, 2006, for the day of Europe. In 2007 it was a sporting event that was the source of a very special illumination: For the Rugby World Cup, organized in France. For this occasion the Eiffel Tower projected on its flank rugby poles in the center of which passed a ball of 13 m long, simulating a penalty. Here again the effect was striking, and very temporary, the competition only lasted a month and a half (September 7 to October 30). The Eiffel Tower has become for nearly two months the symbol of world rugby. Finally in 2015 took place the COP21, the 21st International Summit for Ecology held in Paris in late November and early December. On this occasion the Eiffel Tower took the green color. A mobile application allowed visitors, for a small fee, to grow a flower on the monument. At the validation of the payment of the projectors made a play of lights showing a plant to develop until the growth of the flower. It was very original and a real success. It is very common that the Eiffel Tower is represented on the logos, most of the time it is about Parisian organization, but not only. Here is a small list that covers a wide variety of areas. The logo of Paris airport is quite logically a winged Eiffel Tower. This logo is old enough now. The Paris Aquarium also uses the Eiffel Tower. The letters that form the word "Aquarium" have a very successful aquatic style. The famous Parisian brand uses the Eiffel Tower to materialize the two T of the word "Lafayette". COP21 was an international meeting in November 2015 on global warming. The logo used the Eiffel Tower, of course. The icon of the School of Neuroscience Paris-Ile-de-France is an Eiffel Tower in the colors of the school, red and black. The Green Building Council is an association that works in the environment, the logo represents an Eiffel Tower with a leaf of a tree. The logo of the organization of the Olympic Games in 2024, which takes over the Eiffel Tower, while in 2008 and 2012 it had been abandoned. The Paris marathon is naive. It is simply blue with a red Eiffel Tower. The logo of the Paris Football Club. The logo of Paris Galaxy Handball. The logo of Paris Saint Germain. And finally, here is the logo of S.E.T.E, the Exploitation Company of the Eiffel Tower. The logo invented during the attacks in Paris in October 2015. It was widely relayed on social networks. The firefighters of Paris have a logo that largely uses the Eiffel Tower. The logo of the private company Paris-Taxi, specialized in the supply of a taxi in Paris region.